I am a big fan of seeking out flea markets and thrift shops. People are either creeped out by my second hand scavenging or, they get it!. My office is furnished with an American Art Deco dining room suite. When I came upon this set at a flea market, it was tucked away in a corner…and not surprisingly, set up as a dining set. I exclaimed that it would be perfect for office furniture or a bar. The proprietor was pleased that I could find a use for all of the pieces, as was I….maybe he was just happy to get rid of it, who knows:)?..being agreeable has its advantages when it comes to sales. The chairs I recovered myself(I am patting myself on the back;)…even though I was personally ridiculed by a Toronto designer who said that “animal prints are out”! Oh really, ask Diane von Furstenburg, Ralph Lauren, …or me! …o’k I am not an expert, but I do love animal prints; they are a classic to me. However, it is just like a person wearing the latest trend that does not match their personality, you can tell! Be surrounded by what speaks to YOU, not what someone else thinks you should have. Every view that your eyes fall upon in your home is its own Still Life. Be the artist of your own life, interiors and otherwise. I have yet to understand the snobbery of one who turns their nose down to garage sales, flea markets and second-hand stores. Lets be honest here; there is no difference between shopping at value village and an upscale antique store, except for the sticker price and the known pedigree of the item. Like many people my age, “back in the day”, you might just as easily find your apartment sofa on a sidewalk as a parents basement. It was common to see milk crates as chairs or book cases, and inflatable mattresses as beds. Today, our university aged children have cool bedrooms from Ikea or…gasp! The Brick. 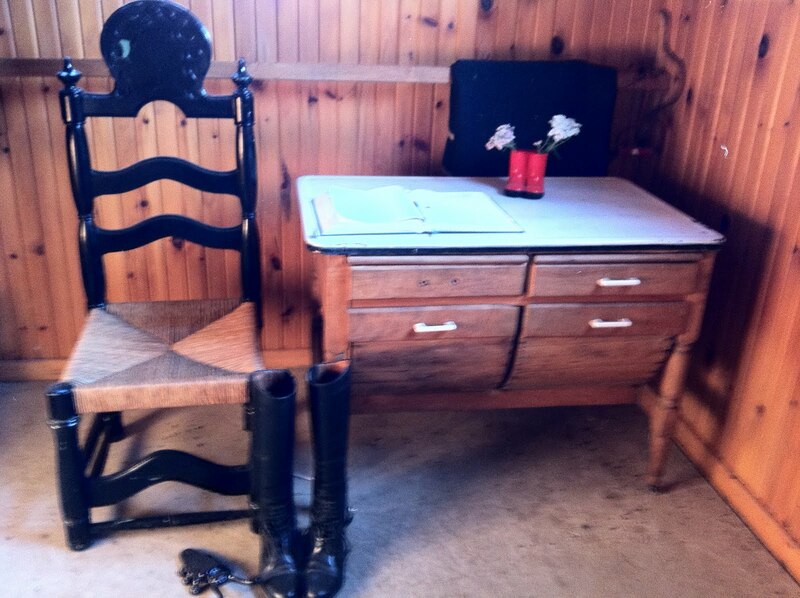 This is a picture from my tack room. The bakers table was my first purchase of an antique 18 years ago…I qualify it because I had previously owned lots of old/used things but this one had the cache of being labelled an “antique”! I store horse wraps in the drawers and keep my journal out for daily reminders, changes in feed or notes to the vet. The chair I love. Good friends of ours were renovating a ski house 10 years ago and this was not going to be part of the new plans. I was immediately drawn to the odd shape/tall back, and appreciated the craftsmanship of the woven seat. In our previous home, it sat at the front entry. Here, it is perfect for pulling my boots on. Ooooohhhhh! how I adore this piece! This was once the sideboard of a dining set. I found this at a flea market along with the table, china cabinet and six chairs. I broke the set up for different uses in the house. Here, it is used in our office as a credenza, flanked by two of the chairs. I guess what I am saying is….do not be afraid to look for ways to add function in your home by buying second-hand. I feel better knowing that I have a beautiful and solid piece of “previously enjoyed” furniture, than to buy new, just to say that it is new. 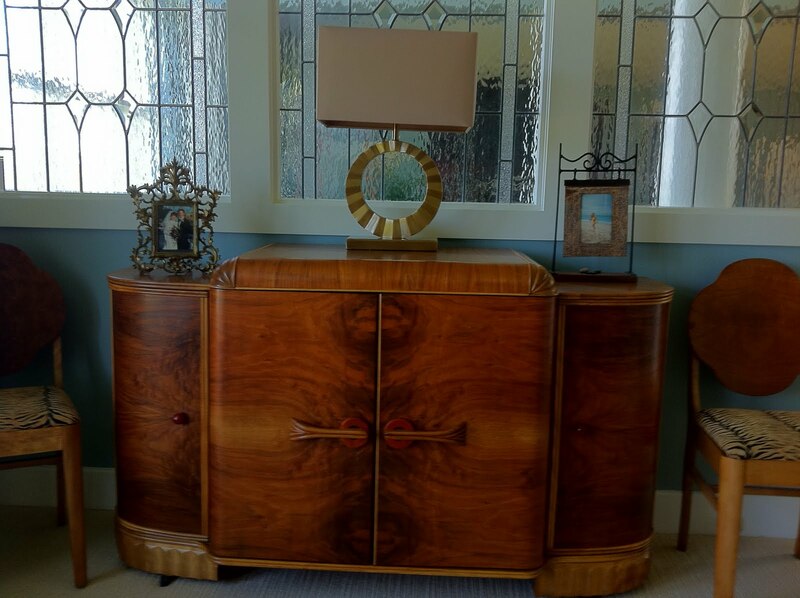 It is gratifying to give credence to well designed, used furniture, and then make it your own. It is also good for our environment. When we consciously make decisions that honour the past, and protect the future, then invariably we all gain. So every weekend I wish you the best basement stealing scores, successful thrift-shop surfing and unfettered flea market fascinations that all carry fun, frugality and vision!